Welcome to this week's edition of Frugal Friday! So, who's getting up early (or in my case staying up REALLY late) to watch the royal wedding? So without further wedding-related procrastination, here's my Frugal Round-up for this week. 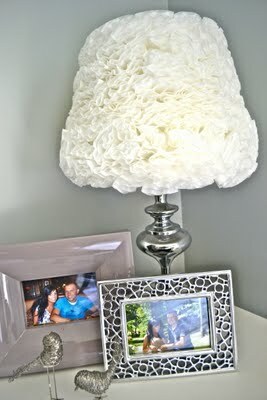 Liz Marie shared her very clever coffee filter lampshade. Too cute for words. Less That Perfect Life of Bliss shared her lovely French Buffet makeover. I especially liked her "If You Give a Pig a Pancake" style post. So fun. 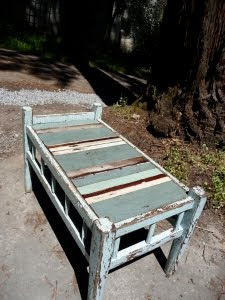 School Daze shared a scavenged outdoor table that I just love. This is frugality in all its glory. And finally, Evolution of Style shared her powder room makeover. Loving this stencilled wall. Thanks, Wendy, for featuring my buffet! I always enjoy your party! Oooh, that buffet is BEAUTIFUL! Thanks so much for the feature! Love checking out all of the wonderful creativity with your linky party! Not up late for the wedding, just up late for me. Sadly, it's my only REAL ME time! Thanks for hosting!! So many sites to visit...this is going to take a while. Thanks so much for hosting week after week!!! just linked up! you have a great blog!! Today is the first time I linked up! I'm so excited to participate. I hope I followed all the rules :) I'm sure you'll let me know and you'll remember that I'm still learning! I appreciate all of your encouraging words, you're such an inspiration. So many great posts linked - so much fun to go through. I can't believe how lovely that bathroom is-what patience. Great party as always! Thanks for hosting! Thanks for hosting, Wendy. I adore that coffee filter lampshade & salvaged table. Oh yum!